The enchiladas are without a doubt one of the most rooted dishes to the traditional Mexican cuisine. Each region has its own enchiladas recipe with local ingredients and that’s why more than 300 types of enchiladas can be counted, throughout Mexico. – Is such the importance of the enchiladas that a fair specially dedicate to them has been created in Mexico city, to which every year hundreds of chefs attend to present their own version of the enchiladas. 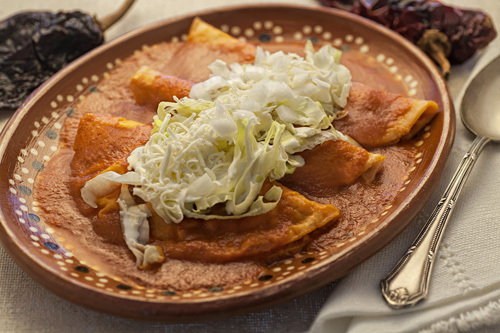 This enchiladas recipe consists of fried tortillas bathed with red salsa, filled with chicken and garnished with cheese, cream, onion and lettuce . When you taste all these ingredients in one bite, you will know what a true delight is. However the best part of the enchiladas is that they have so much salsa that while eating them more salsa can be put in the enchiladas and the flavor is maximized. But there is still more as the enchiladas dish can be accompanied with refried beans , red rice or white rice. Also the enchiladas’ salsa can be mixed with these garnishes and the combination of flavors is exquisite. To make the enchiladas many steps have to be followed and kitchen knowledge is required. Give a very homemade flavor to the enchiladas by preparing your own corn tortillas. The salsa that is used in the enchiladas is prepared with chilies that are not spicy. However if you want more hotness in your enchiladas use 1 seeded arbol pepper, at the moment of preparing the salsa. In this recipes the tortillas are fried and it is very important to use vegetable oil because it resists high temperatures. Cut 1/4 of a lettuce into strips and reserve. Finely chop 1/4 of an onion (1.3 oz), then reserve. Repeat the same procedure with the other 9 fried tortillas. Upon completion if there is red salsa remaining pour it over the enchiladas. * You can also put avocado strips to these enchiladas, they give a very good flavor. Variation: Feel the flavor difference when the enchiladas are prepared in its green version. Did you like the Red Enchiladas?